The Constitution of Japan has served the country for more than half a century, creating and maintaining a stable and functional democratic system. 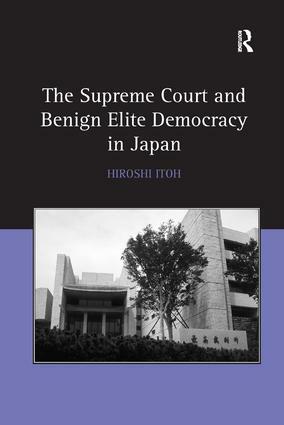 This book innovatively interprets Japanese politics as a ’benign elite democracy’ whilst demonstrating the Supreme Court's vital contribution to the political structure. In The Supreme Court and Benign Elite Democracy in Japan, Hiroshi Itoh presents the first empirical study of judicial decision making under Japan's Constitution. He examines the Supreme Court’s records regarding the protection of civil rights and liberties, the preservation of the conformity of lower levels of laws and regulations to the Constitution, and the maintenance of the Court's relationships to the political branches. The analysis of these three aspects of constitutional litigation reveal how the Supreme Court contributes to the efficacy of constitutional democracy by keeping the system adaptable to the ever-changing environment in and around Japan. Contents: Foreword, David S. Law; Introduction; Elite governance in Japan; Judicial decision-making; Judicial impact and feedback; Judicial attitudes on the Grand Bench; Judicial attributes of justices; Judicial role of the Supreme Court; Conclusions; Appendices; Bibliography; Index. Hiroshi Itoh is a Professor in the Department of Political Science at the State University of New York at Plattsburgh. Works he has co-written or co-edited include The Constitutional Case Law of Japan, 1970 through 1990 (University of Washington Press, 1996) and Japan's Public Policy under the Gun of Globalization (Edwin Mellen Press, 2009).